North Harris offers superb opportunities for many outdoor pursuits including walking, mountain biking, climbing and sea kayaking. Due to Scotlands Outdoor Access Code http://www.outdooraccess-scotland.com/ all of the North Harris Estate can be accessed by responsible people wanting to enjoy outdoor pursuits. The walking on Harris is second to none in terms of variability of terrain. There are a network of core paths which although hundreds of years old are still in good condition and easily followed. Please see our paths section for more detailed information on each path. For the more adventurous there are several amazing routes that take you away from the paths into the hills proper! The terrain is as one could imagine, highly variable and changeable with the weather conditions. Proper equipment and experience are highly recommended due to the remote nature of these routes. Climbing one of the Harris hills will reward you on a clear day with incredible views! On any walk in Harris you are likely to see some of our amazing wildlife including both species of eagle resident in the UK. The North Harris Trust produces a free”Walking on North Harris ” leaflet, providing information on some of the easier routes on surfaced paths. Cicerone produce an excellent book detailing some of the longer harder routes on Harris and Lewis. From April until October, the North Harris Trust Ranger Service provides a comprehensive guided walks programme which are free to attend and give an excellent opportunity not just to get out for a walk but also to learn about Harris’s fantastic wildlife, geology and cultural history. There are a couple of guides on Harris who offer bespoke guiding services for those wanting to venture off the beaten path. Over the past decade mountain biking in Scotland has grown massively and people are looking for new and exciting places to ride. North Harris is one of them! There is some fantastic mountain biking on Harris with some challenging climbs and sick descents. The Postmans Path loop is an 18km loop which can be ridden in both directions but we would reccomend that it is ridden clockwise from the car park at Urgha or Lacasdail Lochs. Riding the loop this way round gives you an incredible decent to finish and reduces erosion. The Bogha Glas to Miabhaig track is 17km of MTB fun! The track has some hard climbs and rad descents. The track is rocky in some places and quite boggy in others. It does ride better starting from Bogha Glas seeming that you get three good descents for only two real climbs. For a quick hit of adrenaline try riding the track to Sron Uladail. It starts with an easy haul a metalled track up Chliostair dam. From there a mountain path leads you up to Loch Ashavat. From here the fun starts as the descent begins! This descent is one of the best on Harris, its fast, tight and loose! At the bottom you will be blown away by the enormity of Sron Uladail. The return is the reverse of what you have just ridden, onthe descent from Loch Ashavat to the dam it is quite possible to reach warp speed! It has been claimed that the Bogha Glas to Miabhaig track offers some of the best mountain biking in the country. The open vistas on this route are a welcome contrast to many mountain biking hotspots on the mainland where routes are often follow forestry tracks enclosed by trees. The extensive coastline provides a range of kayaking opportunities from sheltered conditions in the sea lochs in the east to more challenging conditions on the exposed west coast. 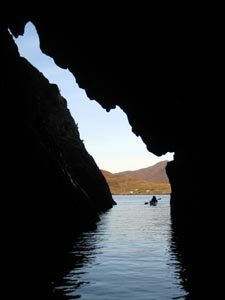 North Harris is also a great base for longer kayaking expeditions to offshore islands such as the Shiants or into remote areas around Loch Reasort on the Harris/Lewis border. However, the weather conditions on Harris are notoriously changeable and coupled with strong tides, sea conditions can rapidly become dangerous for the inexperienced paddler. The Scaladale Centre, which is operated by a local charity, offers a range of outdoor activities for groups and families including gorge scrambling, coasteering, climbing and sailing.